Barbra Streisand has been a legend so long that a new generation of fans has no way to connect her with the unknown young singer who ﬁrst astonished audiences in 1960 at a Greenwich Village gay bar called the Bon Soir. But gays have cherished Barbra from the start, and she has returned the sentiment. 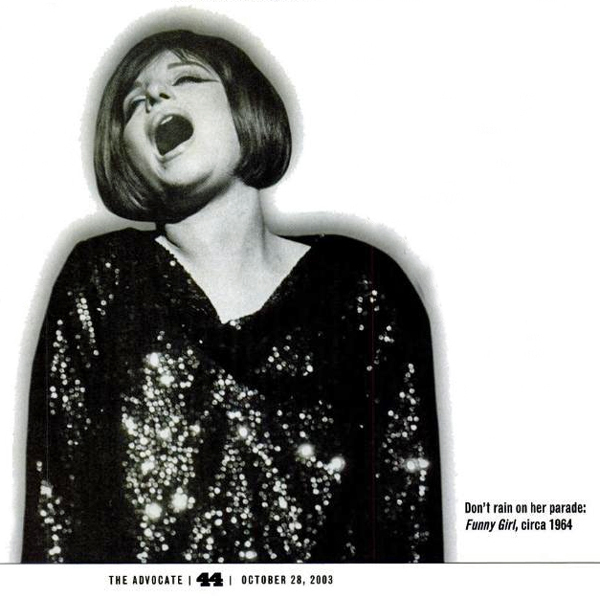 Streisand was recognized on the cover of The Advocate in 1999 for her activism on behalf of gay and lesbian civil rights and AIDS-related causes as well as for her role in creative projects like 1995's Serving in Silence: The Margarethe Cammermeyer Story. 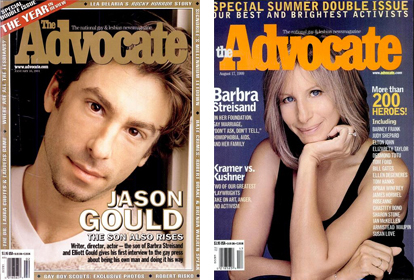 In 2001, Streisand's ties to the gay community were reinforced when her openly gay son, Jason Gould, appeared on The Advocate cover to talk about directing his first film, Inside Out. ln 1998, Streisand married James Brolin; by all accounts, the marriage has reenergized her emotionally and creatively, leading her into the happiest phase of her life. 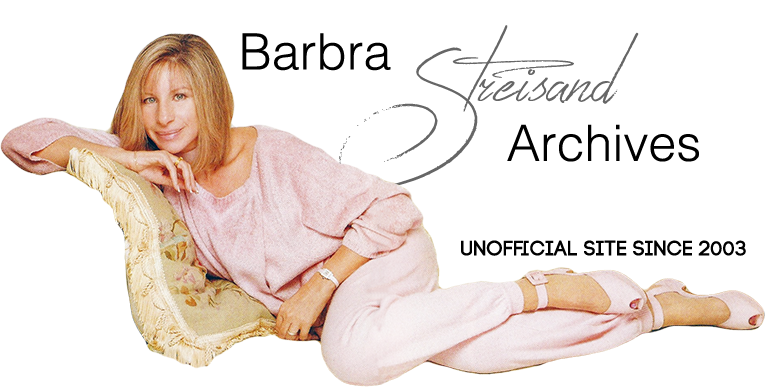 With The Movie Album, Streisand the singer is back. At 61, she's in magnificent vocal shape, and she commands as no Britney or Beyoncé ever will. We spoke with Streisand by phone from her home, with her dog, Sammie, playing in the background. It makes total sense that you—as an actor and a singer— would want to record a movie album. Had you been thinking about it for a long time? Oh, God, yeah. Actually, somebody said to me, “You mentioned doing a movie album 17 years ago—what took you so long?" l think I said, "I had to become a director ﬁrst." l dedicated [the album] to Gregory Peck, who was a great screen star. That's the feeling of the orchestrations. Since l was the producer, it just had to feel like these movies that l spent so much time at, in my teenage years. So much time in those dark theaters, not wanting to go out into the light, thinking the world was a bit cold and strange and lonely. l got a lot of help in feeling and imagination from the movies that I went to see. What did the movies help you to be hopeful about? Whether l could ﬁnd love in some way, l think. These love stories. When l was a kid, I didn't even know I was going to an art house, but l would come out of high school wanting to be an actress, so I did my my book reports on Stanislavsky. [Stockwell laughs] And then l would go into this movie theater next to Erasmus Hall High School—it was an art house, and I would watch ﬁlms. I remember seeing Kurosawa's Seven Samuri. l remember seeing Melina Mercouri in a Greek movie. That must have been it. l loved Phaedra. And I would see these movies that left these great impressions on me visually. Mostly, they were black-and-white. And l guess, you know, l loved that about seeing good ﬁlms. Those are the pictures in your brain. l don't want to look at lousy ﬁlms. l do think they remain indelible in your brain, and I don't want to have those pictures there. You don’t want to foul up the hard drive. Some of the songs on the record are so familiar that I wonder what drew you to them. I was thinking of “Moon River." Well, “Moon River” is the song l sang when I was 19—l guess when the movie [Breakfast at Tiffany's] came out. l was very impressed with the movie and Audrey Hepburn. So I sang it, I think, once—maybe l sang it a couple of nights at the Bon Soir. But I did sing it on that P.M. East show for Mike Wallace. It's so simple and sweet, and for many, many years l thought, Gee, I should record that. How about Charlie Chaplin's song “Smile”? That's a melody I've always loved. And I kind of identiﬁed with him, I guess, when I wrote “Evergreen” for my movie A Star Is Born. Is he the only other one who's written a theme song from one‘s own movie? As a journalist, l never like to say “the only"; somebody always proves me a liar. Do you have a favorite cut on the album, or is that like being asked to choose among your children? Yeah, I think it is. I mean, if l was on a desert island and I could get off if I sang one of two songs, whether it was "More in Love With You" or "The Second Time Around," it would be "More in Love With You." "More in Love With You” is astonishing. The song is such a journey. Oh, how wonderful you get that whole thing, because it took a long time. Do you want to understand the journey? OK. I had heard it on this movie album a long time ago, and it was so beautiful that l picked it to be my wedding march. Marvin Hamlisch did an arrangement of it for chamber orchestra, and that's what was played as our wedding song. Now I was determined to sing it—how does one put lyrics to this score? l called Andre [Previn, composer of the melody] to see if there was a way to make it into a song. [l’d been working with an arranger, and] he happened to like what we came up with, what I had in my mind. So l told the Bergmans [lyricists Alan and Marilyn], "Let's remember, this was a wedding song. Just keep that in mind in terms of the hopefulness of it, the wonder of it." And then they wrote that gorgeous lyric. The sound on the whole record is so romantic. I was listening and thinking, I never get this feeling. Oh, you know what it is‘? I drink it's because movie music is romantic. The music in certain ﬁlms is what makes you cry. Any time you play the theme, you get this feeling—that‘s the power of music. My mother had Alzheimer's, and the only thing she could remember was some of the tunes of her childhood. And so in her last years, I couldn't communicate with her with words, but I would say, “Do you remember, Mom, you once sang that song?" And she could hum that with me. At the end of "You‘re Gonna Hear From Me," there's that musical reference to your hit song "Don't Rain on My Parade" from Funny Girl. It's so witty, so delightful, I laughed out loud. Who decided on that? [Excited] Me, me, me, me, me, me! I was trying to tell the orchestrator what kind of ending I wanted and that it had to be very rousing and orchestral and intricate. And then as we did it on the phone, I remembered and I said, "Why doesn't it have ‘Don't Rain on my Parade"? That's what it's about!" It's a reference to me personally, which is that I did become something. And it was a song that I've always loved since I saw—what year was Inside Daisy Clover, do you remember? I believe it's 1962. Early 1960s. Really? I thought it was in the ‘70s, but I'm not sure. Anyway, I remember seeing that movie and thinking, God. what a great role [Natalie Wood] played. And that scene in the [sound] booth where she went nuts. No, you know what, I bet it was after 1963—|et me look it up. [Flips through book] 1965. Wow, that's interesting. I hadn't made a movie yet, but l got nuts because l was claustrophobic and didn't want to be on the stage anymore. I used to cross off every performance of Funny Girl. Really, until you could stop? Yeah. I couldn't quit. I wanted to quit, but l couldn't quit. But I hated it, and I'd just get sick to my stomach the night before the show started. Forgive me, but why? Stage fright? Stage fright and just being imprisoned. That's why I knew I was meant for the movies. I couldn't stand doing the same performance every night. I always had to be in the moment, and everything had to be fresh and real. l couldn't stand that the plastic ﬂowers had dust on them. [Stockwell laughs] It had to be right and real and spontaneous, yet I didn't want to be there. You know, been there, done that. That's why I loved the movies. You play a scene, you never have to do it again. Anyway, what happened was, I remember being in the movie theater and getting that visceral feeling when she was going crazy in the booth, because it was like me on the stage. It was claustrophobic—l had to get out. So that song has been with me for many, many years. l didn't even know if people knew it. Well, I had never heard it before. I never heard “More in Love With You” before, either. You played “Evergreen” on the guitar originally? That's fabulous. Yeah. I just felt that, as I was editing, the picture was too long, and l cut out this thing that took a year to learn. When A Star ls Born is released as a DVD, it'll have these deleted scenes. How have you changed as a singer since you ﬁrst recorded "Don't Rain on My Parade"? Hmm. You know, l‘ve always approached singing as an actress ﬁrst. So I'm always—l try to be—in the moment. And that's why this video that l made—a limited-edition DVD of me singing in the booth, and I intercut it with ﬁlm on two songs, "Wild is the Wind" and "I'm in the Mood for Love"—and at ﬁrst the editor tried to have me lip-synch with the finished record, and I said, "You'll never do it, it'll never work, because every take is different." [So] this ﬁlm camera captured those two performances in the booth. I only did two takes, and that’s that. The record is different because the record is another take, and we didn't have the cameras going in that one. Your husband is playing Ronald Reagan in a TV miniseries being shot right now. For a Democrat like you, is that a strange feeling? At first it was, but not after I saw some of the film, which is really kind of telling it like it is—like it was, in this case. It's kind of what I know about Reagan, the man who didn't say the word "AIDS" for seven years. l'm not going to talk about him. That's for him to talk about. I really hate these tabloids. Sure, I understand. But it wasn‘t a tabloid question... Our readers responded to him so warmly when he did the cover of The Advocate. I wondered if there's anything that you can tell our readers about what he's up to these days. Well, he's just growing as a human being. That's the most important thing you can do in life. It's not about your work so much as how you are as a human being. He's just a wonderful human being. Life has to be about—especially in these tragic times and this disturbing political atmosphere—you really have to do what you believe in and put your money and your actions where your mouth is. Also with that, live each day to the fullest, because these are precarious times. Do you think that George Bush is beatable at this point? Yeah. I do think he's beatable. Because the public is ﬁnally waking up to what’s been going on since day one, since he issued his first executive-privilege gag order. This is a government that is not operating openly and honestly and truthfully. As Martin Luther King said, “Truth crushed to the earth will rise again." The gay audience, our readership, has loved you from the start and still does. Do you know why? Yeah. [They were all about] how he identified with me and thought I was the most beautiful woman on earth. But I think he once told me—because he was a wonderful and divine human being, kind and courageous and so talented and very political and outspoken, which is rare—l think it's like he said, [speaking] for those who felt different. I emerged in the era of Sandra Dee and beach movies and little girls with turned-up noses. And I guess I was different and I refused to change for anybody. I was saying,"This is who I am, and I have something to say—listen to me." When people said, "Change this" and “Cut your nose off"—whatever they said about me—the put-downs didn't work. I don't even know. It's hard to talk about yourself in that way, isn't it? Like, what did I have that worked? Well, let me ask you the opposite, because maybe that's easier: What did the gay audience bring out in you? Singing to a gay audience— was that a special feeling for you from the start? Well, it was a big support system since my first two clubs—well, the Lion was a gay club which I didn't even know was a gay club. [Laughs] And Joel Schumacher, the director, said he was a waiter there when I was there. But they were a very supportive audience—I didn't know if I was good. Everybody needs a support system. You can easily think you're terrible as well as thinking you're OK. I mean, it can go either way. That's still me today. I really didn't know if anybody would like this album. I said, "Jesus, some of these songs are kind of obscure, and they're all kind of slow." I thought, Jesus, I hope people like it. I was just being true to myself, singing the songs that I related to on a personal level, and I'm just thrillingly surprised that people are thinking that it's really one of my best.